Yes!! That’s really true. 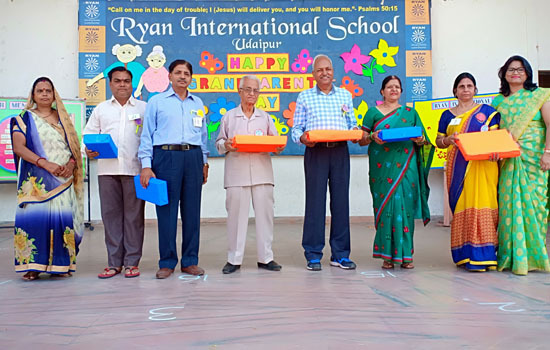 The beautiful joy of being with the dear Grandparents could be seen in the Ryan premises when the tiny tote of Mont Wing expresses their gratitude to all the Ryan grandparents present on the cool cozy Thursday morning in the school premises. The event began with the blessings of lord Almighty. Students hailed the Lord with special prayer & Bible reading followed by prayer songs that were sung in regional, National & International Languages. The little tots welcomed their grandparents singing & dancing the melodious welcome song. They then enthralled the audience flaunting on the stage with beautiful old dance numbers. Grandparents were well delighted with the games they played on the spot. They were also interviewed by the YJ’s of our school. The grandparents highly appreciated the ‘Grand Parents Day Celebration’ & shared their feelings of the ultimate bonding of love with their Grand Children. Principal Mrs. Poonam Rathore thanked the august gathering for being a part & make the show hit.